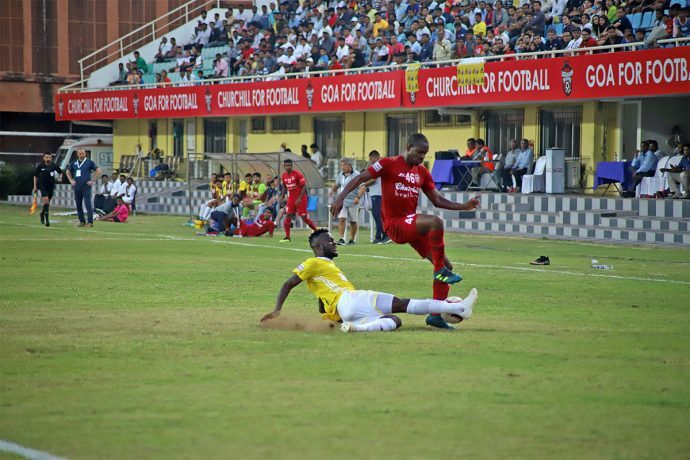 Both Churchill Brothers and Real Kashmir FC went into their return leg fixture at the Tilak Maidan in Vasco Da Gama, Goa, harbouring dreams of going on top of the 12th Hero I-League table. A win for either would have taken them there but at the end of a hard-fought 1-1 draw, both the Red Machines from Goa and the Snow Leopards from Kashmir remain where they were at the beginning of the game – in second and third spots respectively. All the goals came in the second half of the game. Farhan Ganie put the visitors ahead in the 55th minute while the league’s top scorer Willis Plaza got the equaliser in the 69th minute for the hosts. Churchill did finish the stronger of the two teams as the visitors were clearly hampered by the absence of the physical presence of Ivorian striker Gnohre Krizo upfront. In the end though, the game finished in a deadlock. Churchill’s Romanian coach Petre Gigiu made three changes to his starting line-up – playing Khalid Aucho, Richard Costa and Wayne Vaz in place of Israil Gurung, Nickson Castanha and Nenad Novakovic. The last named was forced out due to suspension. The visitor’s Scottish coach David Robertson made just the one change, replacing the suspended Gnohere Krizo with Ritwik Kumar Das. After a scrappy first 20 mins, Mason Robertson for the visitors had the first clear look at goal when Farhan Ganie found him in an advantageous position inside the box with a lovely long ball floated across from just inside the Churchill half. Mason’s full volley was weak though, and lacked placement and was collected comfortably by James Kithan in the Churchill goal. The hosts did make a couple of forays into their rivals box, most of them inspired by their mercurial left-footed captain Dawda Cessay of Gambia, but the league debutant’s defence stood resolute as they have throughout the season. Plaza, the league’s top scorer with 15 goals to his name, did not even get one clear sight at goal as the teams went into half-time tied goalless. Churchill seemed to have shed their cautious approach at the beginning of the second half and pressed hard from the get-go. Then, Kashmir fought back and Ganie got them the lead in the 55th minute, when his long-range grounder from outside the Churchill box on the second attempt, beat a maze of legs and probably blinded Kithan, before going in from under his hands. The goal charged up the home team and Willis Plaza got them back in the 69th minute with his 16th strike of the league. It was Dawda Cessay’s corner which was initially cleared by the Kashmir defence, but only till Nicholas Fernandes who had just come in as a substitute, in place of Chesterpaul Lyngdoh. The midfielder found Plaza inside the box from the left flank with a targetted cross. The Trinidadian Plaza, who had gotten away from his marker, trapped and controlled well, before nailing a left-footer past Bilal in the Kashmir goal. Willis Plaza was declared Hero of the Match for the umpteenth time this season. Both teams now trail leaders Chennai by one point, with their 29 points from 15 games also meaning that Chennai have a game in hand.